Webio the Conversational Middleware Company has launched ‘WebioPay’ its latest platform addition. 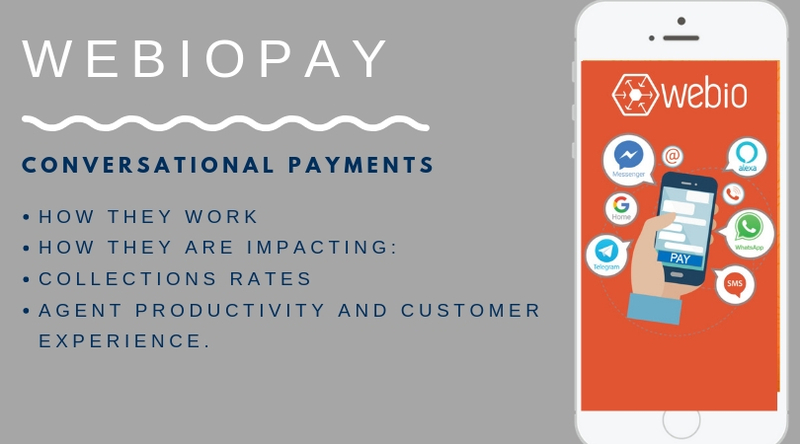 ‘WebioPay’ offers a complete way for contact centres and large enterprises to collect customer payments quickly, conveniently and securely with over 120 global PSPs(Payment Service Providers) using Webio’s conversational payments skill. This addition to Webio’s AI driven conversational middleware platform is the latest is in a series of new skill additions. Designed to optimise customer payments by giving businesses the ability to bring live payment requests and processing into any customer conversations in any channel. At its heart, this conversational payment skill is making it easier for businesses, contact centre agents or even chatbots to send customer payment links as they interact with customers in real time, whether that is a messaging conversation in SMS, WhatsApp, Messenger, Apple Business Chat, RCS messaging etc., an on-line chat or even on a phone call. This ability to enable collections agents and teams to instantly send a payment request to customers is invaluable. It positively impacts on collection rates and delivers a superior customer experience . Clients who have already used conversational payments are reporting a significant increase in customer payments and a time-saving component on the agents’ side. Agents are no longer spending large amounts of time organising customer payment options but instead are sending simple payment requests as soon as the customer agrees to pay, right there in the conversation. Commenting on this latest release Paul Sweeney, EVP of Product at Webio comments “Taking customer payments has become a complex and difficult to maintain process. Getting customers to engage is difficult enough and with the added complexity of PCI compliance requirements adds yet another layer to the challenge." Having the ability to future-proof payments was a core client requirement, “Webio clients with WebioPay can now easily add their existing PSPs or choose from any combination of over 120 global payment gateway providers with a few simple clicks. No longer tied to one PSP, the business now has the flexibility to change payment gateways as the business, payment strategies and customers evolve. A uniquely Webio offering" Sweeney says. Taking the pain out of compliance is a must have with any payment solution and by securely capturing and updating customer card details in a flexible PCI-compliant card vault PCI compliance risk is minimised. A ‘universal token’ protects customer data and transacts against multiple payment services without card data ever touching Webio servers. Webio is going from strength to strength and delivering on its vision of delivering the world’s best conversational middleware solution. This release comes on the back of Webio’s ‘Conversational Forms for the Enterprise’ roll-out which saw clients revolutionise how they collect customer data– by saying goodbye to static forms and introducing conversational forms as part of their digital customer conversations.